A mystery hero like no other. With the most dangerous weapon of all! Los Angeles, the 1930’s. The city of angels. Attracting beautiful people from all over the world with its glitz and glamour. But just beneath the surface is a city stinking of corruption with criminal bosses and politicians squeezing the life out of the city. Crusading politician Owen Patrick is coldly assassinated by his enemies. Leaving behind his wife and daughter. Stunned and enraged by the murder of her father, beautiful socialite Ellen Patrick becomes determined to bring her father’s killers to justice… at any cost. Donning a distinctive white dress and a black domino mask, she becomes The Domino Lady, one of the sexiest – and most elusive – crime fighters of all time! The Domino Lady, created by mysterious author “Lars Anderson”, has been the subject of much speculation and admiration by authors and artists for more than seventy years. 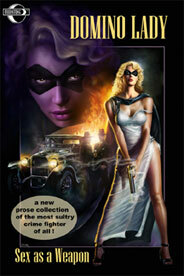 Now, decades after the last Domino Lady story last saw print, Moonstone Books is proud to present nine, all-new tales of one of the world’s first female masked crime fighters. A woman who knew what her power as a woman was and how to use it.